The job of a product and a project manager are different, though both are important managerial roles, as Jennifer Bridges, PMP, explains. Here’s a screen shot of the whiteboard for your reference! While the titles are similar, as Jennifer noted, there’s a difference between a product manager job description and a project manager job description, although both are leadership roles that are, in a sense, acting like the CEO of a particular aspect of the job. Of course, these roles can also vary greatly depending on the types of products or projects being executed in the organization. For example, manufacturing product managers are responsible for tangible products and their delivery, while product managers leading software projects will have different types of teams to assist in the launch and delivery of the software. Additionally, while both roles are technically geared for the delivery of products and projects, there are different processes and best practices required of both roles. For example, many project managers are accustomed to working within the PMBOK or PMI guidelines for best project management practices. Whereas product managers might rely on lean manufacturing processes or lean software development methodologies, which can be wildly different ways of working with teams. As a result, these roles often intersect in an organization, and sometimes produce more than a little conflict. It’s important for managers to understand the difference between these roles and be mindful of areas of overlap. As you can see from the above, there’s a bit of overlap, which can lead to potential areas of conflict. Who gets to talk to the product team? The dev team? The marketing team? Who gets to talk to the customer? Both managerial positions are responsible for major parts of the project and are going to intersect, so they need to know what their duties are and how to work together other for the overall success of the project. Pro-Tip: Whether you’re a product or a project manager, you’re going to have to work and collaborate at a top level with one another. Their are new collaboration technologies and techniques, as well as innovative ways to apply old techniques to foster this relationship. Take it Further: Still unclear about the difference between the two roles? Read more about the discipline of product management on our blog. 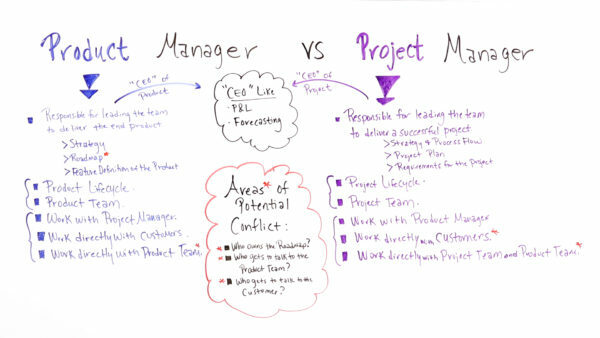 Today we’re talking about a product manager versus a project manager. They sound similar but the roles are different. Let’s take a look at how. First of all, the product manager is responsible for leading the team to deliver the end product. They’re responsible for the strategy, the product roadmap, as well as the feature definition of the product. There is also a separate product life cycle for delivering that product that the product manager is responsible for managing. They also are responsible for leading the product team. The product manager also can work directly with the project manager as well as customer and the product team. The project manager is responsible for leading the team to deliver a successful project. They’re responsible for the strategy and the process flow of the project. They’re responsible for the project plan as well as the requirements for the project. And, there is a separate project life cycle the project manager is responsible for managing. They also have an entire project team that they’re responsible for leading. The project manager can work directly with the product manager. They can also work directly with the customer and the project team as well as the product team. Both roles can be perceived as CEO like. It’s depending upon the complexity and the span of control and if it includes being responsible for the profit and loss statement or forecasting for the project. Then, there are a couple of areas of conflict that can arise. First of all, who owns the product road map? Of course, you would suspect that the product manager wants to own that, but sometimes the project manager does as well. So, you have to determine who really owns and is responsible for the product road map. And then, who gets to talk to the product team or the customer? Both can, but as you can suspect, then it can get confusing if too many people are going to each and asking for input or providing status. If you need a tool that can help you manage your product or your project, then sign up for our software now at projectmanager.com.